I sit a lot. Most of the day really. I sit when I drive to work. I sit at work when I write software. I sit when I eat lunch. I sit when I drive home from work. I sit when I eat dinner. I sit after dinner when I write blogs and comics and sometimes other software. Always sitting. In today's comic, the frogs are picking a new chair of the board, which to them means a new thing to sit on when they have their meetings. Frogs also sit most of the time, but they aren't bipedal. Humans are designed to stand up on two legs. So why do we sit so much? It turns out that sitting all the time is probably taking years off my life. The sedentary lifestyle that so many of us have is dangerous. I need to sit less. Could a standing desk be the answer? 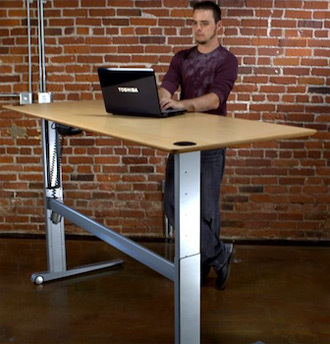 If you are unfamiliar with standing desks, they're basically just really high desks. Instead of a chair in front of it, you stand up to use it. You can write or type on it. Supposedly they are better for you than sitting at a normal desk all day.